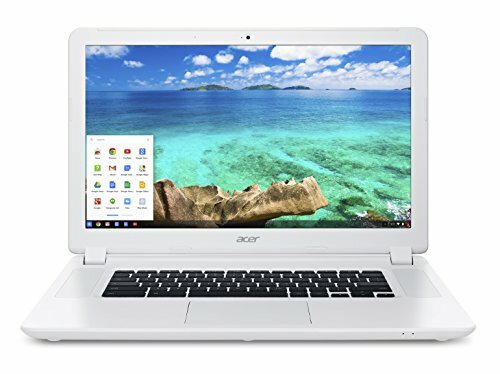 The Acer Chromebook 15 is the perfect example of how Chromebooks have progressed over recent years. No longer does the word 'Chromebook' dictate an ultra-budget look and feel, with the Acer 15's aluminium panel finish paving the way for this future of this product type. Igoring its not inconsiderable size - no other manufacturer outputs a 15.6-inch model in this market - we're yet to see an affordable Chromebook as appealing as this new release. It's also part of the new wave of Chromebooks to offer Android app compatibility, ushering in a new era of flexibility. There's no doubt about it: this is the best looking affordable Chromebook on the market. Because it looks genuinely premium. The inclusion of an aluminium top cover and palm rest puts it in a similar league to laptops some hundreds of pounds pricier, with the chamfered edge finish of the trackpad being a particular highlight. Even the way the speaker grilles and milled have a polished aesthetic about them. Considering the Acer Chromebook 15 will be priced $400/€500, that's quite an achievement. Sure, Google's own Pixel Chromebook was higher-end - but twice the price and released at a time in Chromebook's life some years ago when that proposition simply didn't make any sense (it still wouldn't, to be fair). The Acer Chromebook 15 has its considerable footprint in the here and now, with a toe in the future too. The inclusion of USB Type-C and full-size USB ensures nothing is off limits, plus there's an HDMI port, headphone jack and microSD card reader (we'd prefer full-size SD, as almost all cameras use this standard). All the stuff that students, creatives and workaholics are likely to need. However, that footprint is massive. For us the 15.6-inch scale is less appealing than the Acer Chromebook 14's scale, as it's altogether less 'desktop replacement'. However, the bigger scale means more space for things like those upward-facing speakers, designed for a more premium multimedia experience. At least this year's Chromebook 15 is lighter than the outgoing model. It's hardly lightweight at 1.72kgs, but that's a good 400g or so lighter than before, which is always welcome. As we alluded to at the beginning of this preview, the updated Chromebook software can run Android apps from the Play Store. That means access to productivity apps, plus games, expanding the Chromebook proposition. Now, the Intel Celeron or Pentium processor found within isn't going to be the most powerful thing on the market, but its fanless design does ensure silent operation. Acer also claims over 12 hours of battery life per charge given the light spec, which we can't verify having used the machine for a short period of time - but the physical space for batteries and spec limits means we anticipate the Chromebook 15 will have more stamina than its Windows 10 competition. In terms of screen, gone are they days when Chromebooks offered poor solutions. The Acer 15's panel is large, but crucially it's an IPS display - which ensures decent viewig angles without the contrast falling off a cliff. So good job in that department. Yes, it's only Full HD resolution, but that's as much as most will need - and a degree better than some of the smaller-scale models out there. The screen comes either with or without touchscreen control, depending on whether it's the CB515-1H or CB515-1HT model - the 'T' describing the touch aspect. The Acer Chromebook 15 might be large, but it's certainly in charge. As an almost-portable desktop replacement proposition, the combination of its decent screen, stacks of ports, and premium design ensure it'll be a king of productivity. If it's not too big for your needs then, well, you'll not find a better Chromebook for this kind of cash. Due to launch in October, here's hoping the Acer 15's price is reasonable in the UK (it'll be $399 in the US, or €499 in Europe, so we suspect £479 will be the UK figure).